Our chart to lookup Rolex serial by year is a valuable tool that’s simple to use. Quite often, passionate watch collectors and enthusiasts want to know the value of their Rolex timepiece. For instance, are you interested in buying or selling a Rolex watch? Want to trade a watch? If so, it’s important to stay in tune with the ever changing market. Whether you want to buy or sell your Rolex watch, you’re at the right place. Additionally, you can refer to our page that describes the simple process to sell Rolex watches or trade your Rolex. Remember, BeckerTime is one of the most trusted online distributors of pre-owned Rolex watches. As a result, our expertise can help you determine the highest value of your pre-loved Rolex watch. Also, you can find the production date according to the serial number with this simple tool. So, want to know what your Rolex watch is worth? Please contact us if we can answer any questions regarding the age of your Rolex timepiece. We can answer any questions with authority and detail to help you receive the highest market value. Because each new Rolex design is typically evolutionary rather than revolutionary, distinguishing a late model Rolex from an older watch can be difficult. Design differences are subtle. A Rolex Submariner purchased in 2000 is often virtually identical to the same reference purchased a few years later. However, you can determine the age of your watch by using our simple Rolex serial number lookup tool. This easily allows you to determine the approximate production date of your Rolex for watches manufactured up to 2010. The Rolex serial number is sequential from 1926 through the middle of 1987, and you can look up the production year in a reference table. From mid-1987 through the fall of 2009, the serial number contains an easy-to-understand date code. It’s worth noting that in 1954 Rolex production reached 1,000,000 total units. Rather than letting the sequence continue with seven digit numbers, they reset to 100,000. When serial number 999,999 came up again, Rolex continued the serial number sequence into seven digits. Confusion on the age of watches produced between the mid 1950’s and early 1960’s can often be cleared up because Rolex also put date codes inside many of the case backs of these watches. These codes consisted of a two-digit year and a Roman numeral quarter. Beginning in the spring of 2010, Rolex went to a random numbering system for serial numbers. There currently is no tool to identify production date for watches produced after that time. 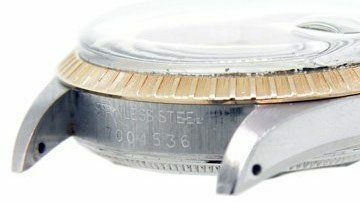 On models produced before 2007, the Rolex serial number is located between the bottom lugs (where the band connects to the case). You will need to remove the band to view the serial number. Between 2006 and 2007, Rolex began to engrave the serial number on the dial rehaut, or inner bezel, at the six o’clock position (as well as between the case lugs) on some models. It takes close inspection but the number is visible through the crystal. Between 2008 and 2010, Rolex gradually phased out engraving the serial number on the case between the lugs. For watches produced from 1926 until 1987, the Rolex serial numbers are sequential. Use the table below to look up the production year of your watch. From 1987 until 2009, the letter preceding the serial number designates the watch’s year of manufacture. It’s also important to note, the Rolex serial number is not an absolute identifier of the watch’s production date. Components may have been stockpiled for some before being used for assembly. But it’s safe to say the serial number provides a 1-2 year range on the age of the watch. This chart indicates approximate production date according to serial number.